If you want a tattoo that is powerful in imagery and spirit, consider getting a bear tattoo. The bear is highly regarded for its strength, bravery and tenacity, all of which make it an ideal subject for this kind of body art. The image of the bear is found in cultures around the world. Many people find bears have a great deal in common with humans, including their diet, place of dwelling in ancient times, and the ability to stand on their hind legs when threatened. For these and other reasons, the image of the bear is one that is revered across many cultures. In some cultures, the bear is thought to be a spirit guide, as well as an animal people can draw strength and power from. It's even perceived as a symbol of motherhood, especially when combined with an image of the sun. Therefore bear claws, bear teeth, bear skins and the image of the bear are all widely used to help capture the essence of this majestic animal. 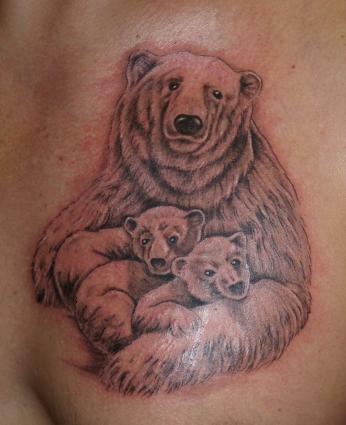 There are countless ways to use bear imagery in a tattoo. Whether the bear is meant to be playful, powerful, aggressive or a guide, there are plenty of design ideas to choose from. The image of a large brown or black bear with its jaws open wide is an extremely powerful image. Having this image as a tattoo anywhere on your body is sure to draw attention. To maximize this design, consider placing it on your back so you have a larger canvas area, or on your knee with the bear's nose on the kneecap itself, for a three dimensional design that virtually roars when you move. The expression "Mama Bear" is one many mothers can relate to. Show your passionate nurturing side with the image of a mother bear and her cub. 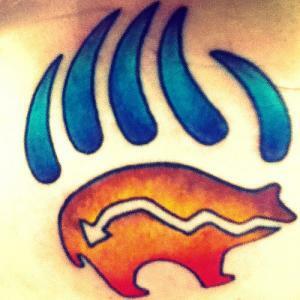 The mother bear is a fierce protector and a force to be reckoned with, and a tattoo like this will be sure to let everyone know you are, too. The image of the bear is seen in numerous cultures as an amulet or talisman that provides protection. The image of a strong (but not necessarily aggressive) bear placed in a prominent area is one way to try to draw the bear's powers to you. Images of bear paws, claws or teeth, either alone or included in a larger design, could all be worn as talisman tattoos. The image of the bear does not have to be aggressive or intimidating. A tattoo of bears at play could be a way to show your love of this animal without portraying its aggressive attributes. You can also use countless cartoon images of bears, whether the design is one that you draw yourself or you choose an image of a beloved cartoon character like Yogi the Bear. The bear's paw, complete with claws extended, is frequently tattooed onto a crest or shield to symbolize bravery. If there is a moment in your life where you triumphed over a difficult situation, consider getting a bear paw crest tattoo to commemorate it. The crest can be used alone, or included in a larger image for further symbolism. In many European cultures, the bear stands for integrity. Capture this look by depicting a bear standing on its hind legs, but with its arms down and body exposed in a non-threatening way. Giving the bear a look of wisdom on its face can help to complete this design. Few childhood toys are as beloved as the Teddy bear. If you've got a picture of a beloved Teddy, or you still have your own Teddy, work with the creativity of a talented tattoo artist to design a meaningful representation of your favorite stuffed toy. Consider working a picture of a Teddy into a feminine design by adding stars and hearts around the animal if desired. 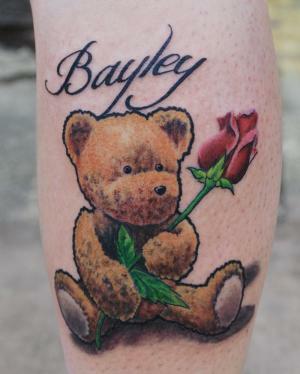 Winnie-the-Pooh is another beloved Teddy bear you might enjoy as a tattoo. Bear tattoo designs can take on numerous characteristics. Use them alone or with other strong animal tattoos such as wolves or tigers to capture the essence and spirit of each of these powerful creatures, and show off your brave, proud, strong and powerful sides all at once.